Native Sun Farm is a lively family farm we really enjoy being around! They grow a wide selection of veggies (lots of root vegetables and tomatoes), and they ‘know’ what they grow. Native Sun Farm has three generations of family living on the farm with them today: Mr. Brent’s Parents, Mr. Brent and Ms. Amy, and their kids Garrett and Little Millie. Farmer Brent and his Farming wife Ms. Amy are trying to make sure their children are raised with a strong education in the vegetables they produce, this helps them learn a great respect for their food as well. Garrett and Millie are off to a very healthy start! Garrett is always snacking on a big zucchini or carrot at the market! (You can tell he enjoys it!!) Speaking of veggies, Native Sun Farm, hands down, grows the best tomatoes! Well, in my opinion, but it still counts! Oh, I would never forget the other veggies either - their baby carrots are the sweetest things! But they might be going out of season, so I encourage you to come to see what they have for yourself! My day always brightens when I enter the market and see the smiling faces of the Native Sun Farm family! They are a great farm to shop with and I guarantee you will make some great meals with the vegetables they grow and sell! You GROW Native Sun Farm!!! 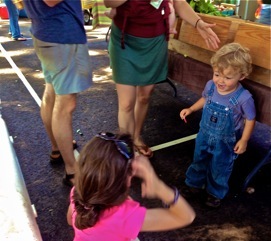 Well, the market was bunches of fun and we all had a nice time with the wonderful weather! I urge you to save the date and come see us at the Athens Farmers Market this week! !